New Oil and Gas Fields Map of Utah – Just the Facts! A sample from the new map. Many Utah citizens, the majority of whom live in the heavily populated Wasatch Front, do not realize that Utah is a major petroleum-producing state. In fact, Utah has over 200 oil and gas fields and 5200 producing wells; more than 1.2 billion barrels of oil and 7.8 trillion cubic feet of gas have flowed from these fields! Utah consistently ranks in the top 15 oil-and-gas-producing states. Oil and gas pipelines crisscross many areas of Utah. The most visible signs of the petroleum industry along the Wasatch Front are the cluster of oil refineries in North Salt Lake and Woods Cross. However, there are no pump jacks, wellheads, or drilling derricks in that area. So, where are all the oil and gas fields in Utah? 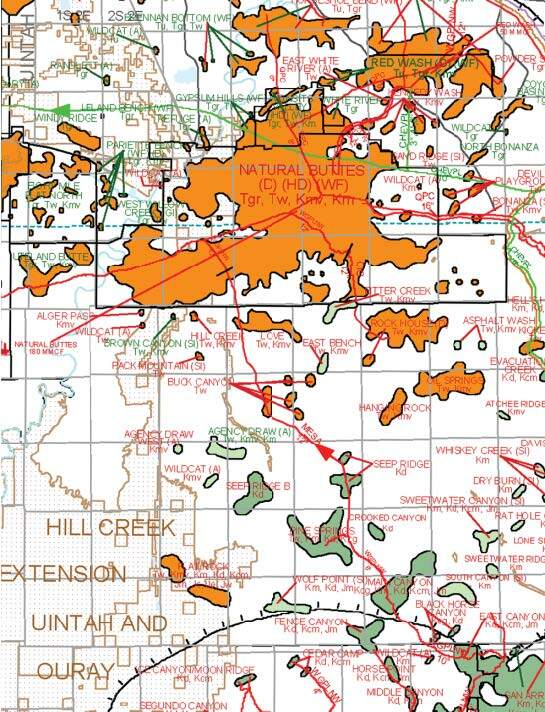 The answer to that question can be found on a new map, Oil and Gas Fields of Utah (Utah Geological Survey Map 203DM), available in both hard copy and digital format. This map presents a wealth of information, and shows more than just the location of oil and gas fields. The color of the fields is coded to the geologic age of the oil- and gas-producing rocks (reservoirs). The names of the producing fields are also color-coded — red for natural gas and green for oil. By each field is the name of the producing rock formation (typically more than one), and various special field designations. These designations include status (abandoned, shut-in, or gas storage), unique types of produced gases (helium, carbon dioxide, hydrogen sulfide, and coalbed methane [natural gas from coal]), and distinct projects designed to increase production (horizontal drilling, waterflooding, and gas injection). When a petroleum geologist proposes a plan to drill a new well, one of the first questions managers often ask is “Where is the nearest pipeline?” Produced oil can be trucked from the wells, but gas has to be transported via a pipeline. The new map shows the approximate locations of major oil and gas pipelines in Utah, pipe diameter, direction of flow, and current operators. Natural gas processing plants and oil refineries, daily capacities, and operators are also shown on the map. The map outlines key geologic/physiographic features such as major plateaus, uplifts, and sedimentary basins. Most oil and gas fields are located in two large basins – the Uinta and Paradox Basins in eastern and southeastern Utah, respectively. The map shows where both Precambrian (greater than 570 million years old) metamorphic and Tertiary/Quaternary (66 million years or younger) granitic and volcanic rocks are exposed on the surface. Very little oil and gas have been found in areas where rocks of these types are present. Other items identified on the map include major roads, reservoirs, and rivers; county boundaries and seats; Indian reservations; wilderness areas; and national parks, monuments, and recreation areas. Thus, the map shows where the oil and gas fields and pipelines are in relation to these various features, many which are environmentally sensitive. The new oil and gas fields map was produced not just for oil and gas companies. It can be used by government land managers, regulators, and decision-makers; environmentalists; Native American groups; and farmers, ranchers, and mineral-lease owners. This map will help inform all Utahns as to where the oil and gas resources are located without taking sides on the issues of exploration and development. Some may be surprised by what it shows. For example, new gas exploration proposed near the archeologically rich Nine Mile Canyon area northeast of Price has created a storm of controversy written up in local newspaper articles. However, the map indicates that there are already several gas fields in the area (which include 22 gas wells, some just off the road, that have produced over 10 billion cubic feet of gas) and a 20-inch gas pipeline running through the canyon. The map also shows a string of producing and abandoned oil fields between Arches and Canyonlands National Parks, while another abandoned oil field, Virgin, lies just west of Zion National Park. A 26- inch-diameter gas pipeline crosses through the middle of Arches National Park. 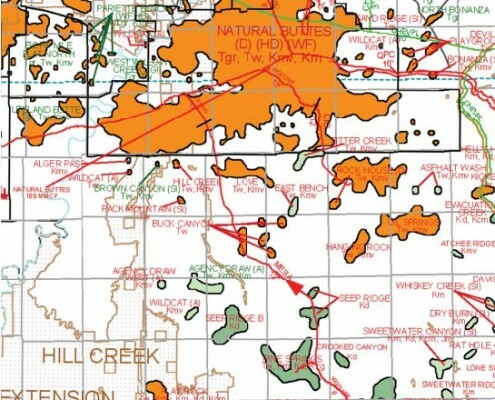 One oil field, Upper Valley, is partly within Grand Staircase-Escalante National Monument. This field has 21 wells that produce nearly 17,000 barrels of oil per month (trucked to market) totaling about 27 million barrels of oil since its discovery in 1964. Finally, it may amaze many to learn that there are major oil and gas fields only 40 miles east–northeast of Salt Lake City. The same rocks that produce in those fields (the 200 millionyear old Jurassic Nugget Sandstone and Twin Creek Limestone) crop out at the mouth of Parleys Canyon along Interstate 80. These fields have produced 165 million barrels of oil and 158 billion cubic feet of gas! A map showing mineral resources and methods of transport is nothing really new. In 1815, an Englishman named William Smith, self-taught engineer, fossil collector, and “canal digger,” published the world’s first geologic map – a geologic map of Great Britain. This remarkable map showed where the various rock formations crop out and predicted where they were in the subsurface. However, the map also included the location of mineral resources and mines – coal, tin, lead, and copper. In addition, the map specifically displayed the railroads, rivers, and canals capable of transporting these mineral resources to markets, factories, and smelters. Ever since Smith’s map was published, geologists have produced geologic and mineral resource maps, which now include oil and gas fields and pipelines.